Since today’s workplaces allow employees to work anywhere and at any time, what is the role of the modern-day office? The new office has become an amenity space—a clubhouse of sorts—acting as an enticing venue for employee activities, benefits, and interactions that can’t occur in a siloed environment. Responding to the needs of a mobile workforce, offices are no longer designed to accommodate cubicles or bullpen spaces that center on heads-down work done in isolation. Beyond providing smaller, shared spaces in which people can work alone or collaborate together, employers are embracing the notion that work truly can happen everywhere. The activity-based work (ABW) model recognizes the human-centered design approach, which espouses that work functions occur in a variety of environments. In our own work, we are exploring the transformation of the workplace from a physical environment into an idea—manifesting the office function to break free of traditional notions. Workplace designs reflect today’s commonly held belief that your work is integral to your identity. Employees want their values reflected in their workplace, and to find meaning in what they do. Purposely designed, a workplace can be a tool for both the attraction and retention of quality employees. The office as a clubhouse draws on the idea of membership: employees want to go to a place every day because they feel a sense of belonging. Early models that exemplify the concept of membership are The Battery in San Francisco and SoHo House in New York—places that offer 100 percent amenities and zero workstations, yet fully support the modern worker. These are communities where people successfully make connections and still get plenty of work done. Employers no longer just pay employees for their time—they also provide access to amenities and foster a more collaborative and productive environment. Historically, employers often made decisions based on real estate instead of on employee needs. Now employers are heavily influenced by the desire to attract talent—a significant departure from the workspace design approach of the past, which was more focused on productivity. Employers are acknowledging employee behavior and expectations for added amenity space. In our projects, we aim for a ratio of 60/40, with 40 percent of space in offices dedicated to amenities. We engage in many conversations around change management with our clients. Many of them are moving toward offering unassigned desks, but at times, employees can view this action as having their workplace identity, or their work “home,” taken away from them. After all, many of us have had assigned desks since we were five years old! Savvy employers mitigate this by trusting and empowering their employees to work independently, which, in turn, makes them more productive. When we begin the design process, we first hold a meeting with leadership and conduct extensive onsite interviews with both executives and employees. Examining data from sources, such as card readers and room booking systems, helps build a picture around these specific observations because there is never a one-size-fits-all solution. In the case that the result is a dramatic departure from a company’s existing structure, we might conduct a beta test within their current office by temporarily altering one department. It can be worthwhile to delay moving out, or beginning a renovation, in order to identify the most effective solution. Architectural strategies that often achieve a club-like atmosphere within an amenity-rich office focus on expandability, such as designing mobile partitions off of a main thoroughfare, or allowing meeting spaces, reception areas, or cafés to expand into adjacent hallways. For Google Tech Corners, Blitz redesigned 37 new collaborative spaces within the 420,000-square-foot Google Cloud campus in Sunnyvale, CA. These residentially inspired environments create a sense of comfort and ownership and act as central hubs for innovation and cross-departmental collaboration. 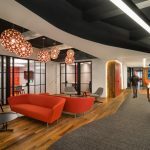 The removal of partitions and semi-enclosed nooks at Google Tech Corners allows daylight to penetrate the interior areas of the floor plan and present a clear visual connection between adjacent open office spaces. Wooden trellises enclose the lounges and offer a warm, rustic contrast to the industrial feeling of other technology offices. Our design team layered the spaces with carefully curated décor, potted house plants, unusual lighting fixtures, and an assortment of vintage-inspired furnishings and residential elements to evoke the comforts of home. Attributes you wouldn’t typically expect in an office include mini bars with a range of alcoholic beverages, Scrabble board wall art to create positive distractions, tray tables to utilize while eating and meeting, blankets for a quick catnap, and a slew of tchotchkes serving as conversation starters. Seating components, such as comfy rocking chairs for lounging, living room sofas for collaborative brainstorming, and built-in banquettes for focused work, offer respite from the typical workplace. In many of our other recent projects, we have begun exploring how occupants’ moods are affected by architectural environments, such as the juxtaposition between loud vs. quiet, soft vs. hard, light vs. dark, and even warm vs. cold settings. The way a space is articulated changes the speed of engagement. In a light and bright space, people are quicker and punchier, whereas in a dark and moody space, they might be more pensive and contemplative. 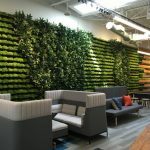 For Malwarebytes, Blitz was hired to design 75,000 square feet of office space on three floors in a multi-floor, multi-tenant building in Santa Clara, CA. The textured carpet, perforated wall panels, and custom-colored light fixtures create a layered sophistication with every surface thoughtfully considered. A major design highlight is a speakeasy-inspired bar and workspace tucked underneath the main interconnecting stair, which offers a moment of delight and surprise within the office. The bar is dark and moody with luxurious chevron-patterned black marble tile lining the walls and drawing the eye toward views of Levi’s Stadium and the mountains beyond. Malwarebytes continued to grow and re-hired Blitz to create more than 25,000 square feet of additional workspace and amenities. Again, we chose dark hues and materials to be consistent with the other floors and to reference the employees’ devotion to the iconic sci-fi film Star Wars. We even concealed the ceiling’s mechanical, electrical, and plumbing components with black paint to evoke the darkness of the Star Wars galaxy and reduce the industrial feeling of the interiors. Finally, it’s important to consider the potential of historically unprogrammed spaces, such as lobbies, that can also be tailored to host a variety of amenities. We are programming unexpected elements in lobbies to create vibrant destinations for building users to work, meet, and socialize. As an example, we reimagined the 3,000-square-foot lobby at 100 California, a multi-tenant office building in San Francisco, to accommodate much more than the usual greeting and waiting. To create a more welcoming experience for tenants and visitors at 100 California, we relocated the security checkpoint and redefined the role from guard to concierge to provide users assistance as they access the building. A sculptural, custom-designed 16-foot-diameter light fixture is the focal point of the lobby. The black steel-encased fixture comprises two interlocking linear elements and appears like a 3D sketch suspended in space. Several flexible and active workspaces create miniature living rooms to offer a dynamic, multi-use area. The basement was renovated into an End-of-Trip (EOT) center for bike riders—including bike parking, a freestanding repair station, showers, lockers, and seating—to support an environmentally friendly method of traveling to work. Designing a human-centered workplace is the key ingredient to ensure that an office is not only practical, but a pleasure to inhabit. Unearthing important aspects of the company’s culture is essential to creating a productive workplace that’s tailored to employee needs. As a result, the idea of the office as a clubhouse becomes an authentic and beautifully inspiring concept that enables workers to have a sense of familiarity, identity, ownership, and most importantly, pride.